Food insecurity is an issue facing families in our communities as one in six individuals in our service area currently struggles with hunger. 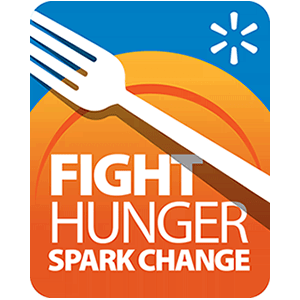 We invite you to join our fight against hunger and help spark change from April 22-May 20 when you purchase participating items at Walmart and Sam's Club stores or by donating at the register. Purchase participating items at Walmart and Sam's Club stores; and online at Grocery.Walmart.com and SamsClub.com during the campaign period April 22-May 20. There are 267 participating products from 18 suppliers: Bush Brothers, Campbell’s, Conagra Brands, Cliff Bar, General Mills, Gold Peak Tea, Great Value, Hidden Valley, JM Smucker, Kellogg, Kraft Heinz, McCormick, Motts, PepsiCo, Post, Uncle Ben’s, Nature Nate’s Honey and Unilever. Donate at the register. $1 helps provide at least 10 ten meals secured by Feeding America. Follow this page and our social media outlets as we roll out stories of hunger and hope all month long. When you help share these stories you give a voice to those in need. Join the fun by sharing your own story. Use the hashtag #FightHunger and tag @FeedingtheGulfCoast.